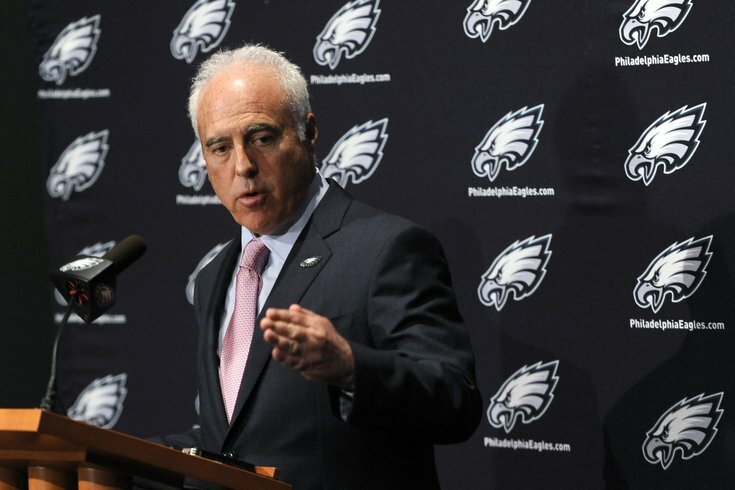 Jeffrey Lurie demonstrates how he intimidates potential head coaching candidates during the negotiation process with karate chops. Three years ago, before the Eagles hired Chip Kelly, they interviewed a lot of head coaching candidates. They may do that again this time around. Let's recap each name they've been tied to so far. The Eagles confirmed that Staley interviewed with the team last week. He served as the team's running backs coach from 2013-1015. Going from coaching four or so players to 53 would be an enormous leap in responsibility, however, interviewing Staley makes sense. He was recently a player in the NFL, and has a understanding of the dynamic between the players and coaching staff, which is something that owner Jeffrey Lurie noted as an important quality in the next head coach. At a minimum, Staley can provide insights into went right and what went wrong during the Chip Kelly era in regard to player-coach relationships. The Eagles announced that Shurmur interviewed with the team on Monday. He, of course, served as Chip Kelly's offensive coordinator the last three seasons, and then as the Eagles' interim head coach for one game, a win, over the Giants Week 17. It has been reported that Gase, the Bears' offensive coordinator, will interview in person with the Eagles on Tuesday, per ESPN's Chris Mortensen. We wrote about Gase at length the morning after Chip Kelly was fired. Gase got his first offensive coordinator job in 2013 with the Broncos under defensive-minded head coach John Fox. In Gase's first season running the offense, Peyton Manning had arguably the best year of his slam-dunk Hall-of-Fame career. Manning's numbers understandably dipped a bit in 2014. After Fox and his staff were fired after the 2014 season, Manning's numbers fell off a cliff, as he has thrown for 9 TDs vs 17 INTs in 2015. More impressively, Cutler's season was without stud wide receiver Brandon Marshall, who was traded to the Jets, and first-round pick Kevin White, who was lost for the entire season with a shin injury. Adam Schefter reported on the Eagles' interest in Pederson, which was later squashed by Derrick Gunn of CSN Philly. Over the last three years, the Chiefs' numbers are very consistent. They are a running team with overall unimpressive numbers, but they do a tremendous job limiting turnovers. That may have more to do with what Alex Smith is as a quarterback than it is an indication of what Pederson is as a coordinator. "Last night, [the Eagles] had a telephone conversation with Adam Gase, who is the Bears offensive coordinator. They’re interviewing Pat Shurmur, their interim head coach, today. They will interview Teryl Austin, the Lions defensive coordinator. They will interview Gase in person. They will interview Doug Marrone who is the assistant head coach/offensive line coach of the Jaguars, former Buffalo Bills head coach. And there’s a long list from there. The list runs about 10 or 12 deep." The Eagles interviewed Marrone before he got hired by the Bills in 2013. The 51-year-old Marrone went 15-17 in two years with Buffalo before he actually decided to opt out of his contract following the 2014 season due to Buffalo's change in ownership. Marrone spent the 2015 season as the assistant head coach and offensive line coach of the Jaguars. Marrone led the Bills to their lone winning season in the last 11 years, when the Bills went 9-7. Paul Domowitch reported that Payton was the Eagles' top candidate. With two years and $17 million left on his contract, the Saints aren't going to fire him, even though the team finished 7-9 this season and failed to make the playoffs for the third time in the last four years. But there are have been indications that both sides might be ready to part ways. As Fox Sports' Jay Glazer pointed out Sunday, though, the Saints likely would want compensation from the team that hires Payton. The price he mentioned was a second-round pick. If only the Eagles had a second round pick. The biggest selling point for me in regard to McAdoo is his work with Eli Manning. We all know the saying that you can’t teach old dogs new tricks. McAdoo got Eli to completely change his game. Eli just set personal records for TD passes and QB rating this season. Alex Marvez of FOX Sports reported that Bucs offensive coordinator Dirk Koetter is on the Eagles' radar. Of course, 60% of the Bucs' yards this season came against the Eagles Week 11.